In past posts we’ve discussed many of the places where we source construction and finishing materials, from White Oak used throughout the homes to sand cast bronze details on doors. This week, our friend and local woodworker, Sam Moyer, turned our attention to Hearne Hardwoods after visiting their facilities on a sourcing trip. Sam has gotten to know the family run operation quite intimately over the years, sourcing much of the wood he uses from Hearne. Founded in 1981 by Rick Hearne with a focus on offering a wide range of fine hardwood species, Hearne Hardwoods has grown to maintain over 140 types of domestic and imported wood including Birdseye Maple instead of Hard Maple, Amboyna Burl, book matched 40”+ Paduak, Koa, Rosewood, Snakewood and French Walnu. It certainly is an impressive collection and it’s all done with ethical harvesting practices as a the lead priority. Hearne sources from areas of the world where sound forest management is in place. They sell a lot of state certified sustainable products such as German Spessart Oak and deal in many salvaged woods such as reclaimed American Chestnut. Trees are a magnificent renewable resource when managed properly and handled with the right considerations at mind for local habitats and communities. 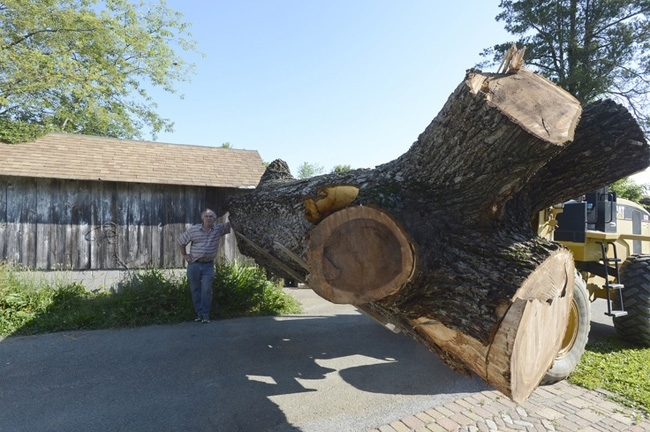 For Hudson Woods, Sam sources the Black Walnut used to construct our kitchen pantry. Three pantries are already under construction and of course the fourth is standing at the model house. Hearne has been a valuable resource for Sam through the process. Sam also purchases a majority of his live-edge material from Hearne along with whatever else he can pick up when he visits the facility. Above: Hudson Woods pantry made with Black Walnut sourced from Hearne Hardwoods. Above: A giant English Walnut log being prepared for cutting with a 67” bandsaw. At left above: An English White Oak log with beefsteak mushrooms. The mushrooms give the heartwood its color and “transform” the log into English Brown Oak. At right, above: “Miscellaneous corner” of the Hearne shop, stacked with a varying woods and cuts.